Patients often ask, “What are cataracts?” A cataract is the clouding of the lens in the eye. Light first passes through the cornea at the front of the eye then through the lens which sits behind the pupil and then focuses on the retina at the back of the eye. 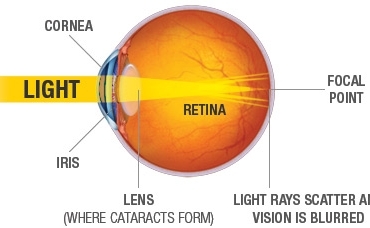 When the lens becomes cloudy less light reaches the retina resulting in poorer vision as depicted below. Congenital cataracts are when a baby is born with the condition or they develop in childhood. Secondary cataracts occur as a result of a medical condition such as diabetes or from use of certain medications. A traumatic cataract will be the result of an injury to the eye. However, they usually occur as you get older and age-related cataracts account for a high proportion of reduced vision in people aged over 65. Poor diet and excessive alcohol consumption. They develop over a long period of time so changes in vision may be negligible at first, however, eventually vision will become worse as it matures. When symptoms of cataracts first appear, the patient will probably be able to improve their vision by changing the prescription in their glasses and using stronger lighting and/or magnifiers to help their near vision. However, if the cataract is affecting day-to-day life and an optometrist can no longer improve the vision enough by changing the customers glasses then they may want them to refer on for surgery to remove the cataract. During cataract removal surgery, which is carried out using a local anaesthetic, the cloudy lens will be removed and replaced with a new synthetic one. The eye will be covered to protect it after the operation. The surgery is usually done on one eye at a time and the patient should be able to go home the same day. The patient will not be able to drive straight after the surgery. The patient will be given eye drops to use for the first few weeks after the surgery and will be advised to avoid doing any strenuous exercise or lifting for a couple of days. It can take a few days or weeks for the vision to settle after cataract surgery. They will have a follow-up appointment at the hospital to check their eyes and they will recommend when to visit an optician for a further check to determine their new spectacle prescription. Optometrists find that the surgery will improve your vision dramatically. If you are suffering from any of the above symptoms, contact us to get an appointment.